Our second BookTalk event of the 2015/16 session focused on Khaled Hosseini’s 2003 novel The Kite Runner. Hosseini’s publishing debut, The Kite Runner received critical acclaim upon release, and was adapted for both screen and stage in 2007. Chairing the event, Anthony Mandal began the evening by discussing the connections between the themes addressed by the novel and the occasion of Human Rights Day (HRD) taking place on 10th December, which was the original inspiration for this evening’s choice of novel. There is an interesting correspondence between the novel and HRD: Hosseini’s text encourages us to consider the question of human rights in the context of two generations of Afghan history (The Kite Runner spans some 27 years of Afghan history, experienced both within its national borders, and as part of the migrant and diasporic community in America and elsewhere). Anthony also addressed Hosseini’s personal history, as an author writing about the experiences of Afghan history on an individual family from the cultural standpoint of the Afghan diaspora in America. Whilst the novel has been lauded in certain quarters, it has also drawn criticisms from that very diasporic community, with some observing that Hosseini’s conceptualization of the Taliban was monstrous and inhuman was crude and stereotypical, with the most hostile critics referring to him as ‘another Salman Rushdie’. Anthony finished by introducing our three speakers: Owen Collins, a history tutor at Cardiff University; Mari Lowe, a PhD candidate in the Centre for Critical and Cultural Theory at Cardiff University; and Radhika Mohanram, Professor of English Literature and Critical and Cultural Theory in the School of English, Communication and Philosophy. Our first speaker, Dr Owen Collins, began his presentation by inviting us to consider two significant questions relating to Hosseini’s novel: 1) What does the book mean to us as individual readers? 2) How do we account for the popularity of The Kite Runner? As Owen pointed out, there is a curious opposition between the novel’s best-selling popularity and its painful, difficult and challenging material. Owen proceeded to outline the national and geopolitical historical context of The Kite Runner, as well as its connections to HRD. When Afghanistan joined the United Nations in 1946, it became one of the first signatories to the Universal Declaration of Human Rights, Article One of which reads ‘We are all born free’: an idea that is central to the novel’s evocation of inter-community conflict and friendship. Owen also drew attention to the fact that the first democratically elected parliament of Afghanistan was established in 1966, emphasising the contemporaneity of Hosseini’s narrative timeline with the reconfiguration of the Afghan political landscape (Amir and Hassan would have been born and growing up in the midst of this nascent democratization of the country). Having discussed the contexts of the novel’s events, Owen addressed the idea of fiction as a form of ‘consciousness raising’, suggesting that novels such as The Kite Runner can be important sites for the exploration of ideas about human rights and political history. Owen admitted to a certain reluctance to begin reading the text, a result of anticipatory emotional investment in the power of the situation it depicts and exposes. He suggested that it was important to recognise how personal and family memory interacts with a wider national history, referencing the two photographs Amir and Baba take with when they flee the country, which become totems of the inseparability of family and nation. Owen also pointed out that the relationship between Amir and Hassan was contained and defined by the wider historical and political divisions of Afghanistan, most notably between the Pashtun and Hazara communities. The presentation concluded by suggesting that the relationship between the text and HRD could best be served by seeing Hosseini’s novel as a gateway for people developing a greater understanding of its issues and desiring to take more direct political action. 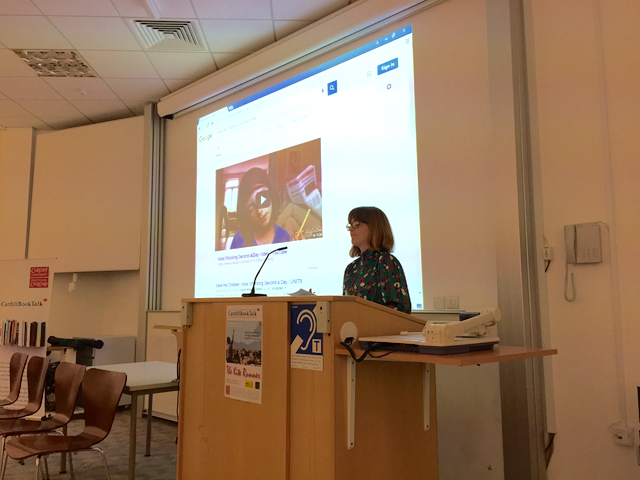 Our second speaker, Mari Lowe, framed her discussion by relating the events depicted within the narrative with the experiences and testimonies of members of the refugee community in South Wales with whom she works through the organisation Oasis Cardiff. Mari shared a Save the Children video with the audience, created in the wake of the burgeoning crisis in Syria, which she used as an example to try and convey exactly how difficult a decision it would be to decide to leave your homeland. She argued that the novel compels the reader to consider what their response would be within this (admittedly fictionalized) scenario, and challenging us to consider what our own responsibilities might be in relation to the themes raised by the novel. Elaborating upon the correspondences between the text and the reality of migration, Mari identified key aspects common to both The Kite Runner and the accounts related to her by members of the refugee and migrant community: the very rapid transition of events that impel people to leave their homeland; the fact that there is never just one journey to be made, but several, and the constant fear and uncertainty which attend each part of this process; and the experience of settling within a new culture and the challenge of accommodating these changes. Mari also suggested that Hosseini forces us to think about those people who cannot leave as well as those who can, and that the chronicling of the migrant mentality is incomplete without reference to those who stay behind. Mari rounded off her discussion by talking about the difficulties faced by migrant communities in their adoptive countries, and how many would like nothing more than to ‘get back to their old selves’. She pointed out that the Asylum Card given to those seeking protection in the UK disbars the holder from being able to work, which often leads to frustration and a lack of a distinctive role and participation within their adoptive culture. Hosseini’s novel, important in many ways, can particularly help to expose the trauma experienced by those seeking refuge, as well as the physical and sexual violence many endure whilst fleeing the turbulent situation in their homeland. Mari urged the audience to see The Kite Runner as a platform to take affirmative action and question our individual and collective responsibilities. The evening’s final speaker, Professor Radhika Mohanram, focused on the central theme of memory, and how it relates, in its various forms, to the events of the novel. She argued that memory (especially when it is part of the diasporic experience) is a social activity, and that remembering always takes place within a social context. Personal memories are mediated by the community of which we are a part, our individual identity emerging from the collective memories of this group. Radhika suggested that this was particularly important because the formation of collective memories is also explicitly tied to practices of representation and the privilege of certain voices: only some parts of the community get to speak and articulate their experiences, and thus memorialize an event or an experience which is often limited or hierarchical. For instance, within the particularities of Hosseini’s novel, it is Amir who re-imagines Afghanistan for us; every other voice and act of remembering is mediated through his perspective, most notably Hassan’s, whose various silences constitute a foundational part of the narrative. Radhika explained this idea in more detail by looking at the example of Indian Independence in 1947. She argued that while this is a central feature of celebration in Indian history, the partitio of the country into two separate nations (India, Pakistan) which coincided with its independence is largely forgotten; India essentially fails to ‘remember’ this part of its history – for instance, there are no museums dedicated to the history of partition. This attests to the selective memory of a country, and how people are socialized to forget just as much as they are to remember, which means that the practice of remembering often involves only a partial selection of histories from which to create collective memorial experiences. Radhika also discussed the important relationship between identity and language, and particularly how the experience of entry into language is paralleled with an awareness of one’s corporeality. Therefore, the reinsertion of migrants and refugees into a new language and culture necessitates a reconfiguration of self and identity. This is the challenge that confronts the migrant or refugee, and the wider diasporic community of which they are a part. (Interestingly, Hosseini’s novel is largely silent about Amir or Baba’s difficulty in grappling with this new body–language when they arrive in America.) Furthermore, in the face of assimilation within an alien culture, the diasporic community tends to remember an idealized version of the home nation, a recollection that can be aided through things such as the ritualized preparation and consumption of food. Within the world of The Kite Runner, food becomes a synecdoche for the nation, to such an extent that remembering becomes an act of ‘tasting words’, imbuing the original culture with a sensory dimension that also resists any attempt at complete cultural assimilation. The evening drew to a close with a Q&A session, with the audience keen to discuss a variety of themes and ideas. The first question concerned the admission made by the three speakers that they had only read the book very recently, and the more general popularity of the book. Some attendees said that, in an important sense, they felt like they had already ‘read’ the book before actually reading it, given that the stories it relates have a universal appeal, and emerge out of a very real and immediate geopolitical reality. It was argued that exigency of reading the text was down to the ‘fabulist’ quality of the narrative, and that this is what recommends the novel as a gateway text for engaging people’s political sensibilities: the reader is able to encounter these stories and be in a position to understand their impact. Other questions addressed the ‘pro-Western’ position of the text, particularly in its depiction of the Taliban. Owen suggested that the Taliban are unquestionably portrayed as monstrous within the novel, but that the West’s conceptualization of the Taliban has changed over time, citing the epilogue to the 1988 film Rocky III (set during the Soviet invasion of Afghanistan), which reads: ‘Dedicated to the brave Mujahideen fighters’. Some attendees suggested that the reader feels more ‘comfortable’ with the novel precisely because Hosseini has himself become acculturated through his experiences of living in the United States. The popularity of the text could perhaps be traced to the fact that its ‘otherness’ was mediated through the American literary market. Other participants, however, saw this as reductive, insisting that the novel was and remains popular because it is a convincing study of human relationships, and not just a chronicle of Afghan history as relayed through the diasporic community in California. It is primarily a novel about redemption and reconciliation, which examines urgent political and religious conflicts from an unflinchingly personal standpoint. « From The Guardian: Are small independent publishers doing the work for big publishers?